Bacon...bacon....bacon. I could go on and on about my love for bacon. It's one of those foods that you can eat pretty much any time day or night. And the possibilities of how to use it are endless. You can eat it alone, on food, around food, in food you name it. Okay I think you get the point, I like love bacon. 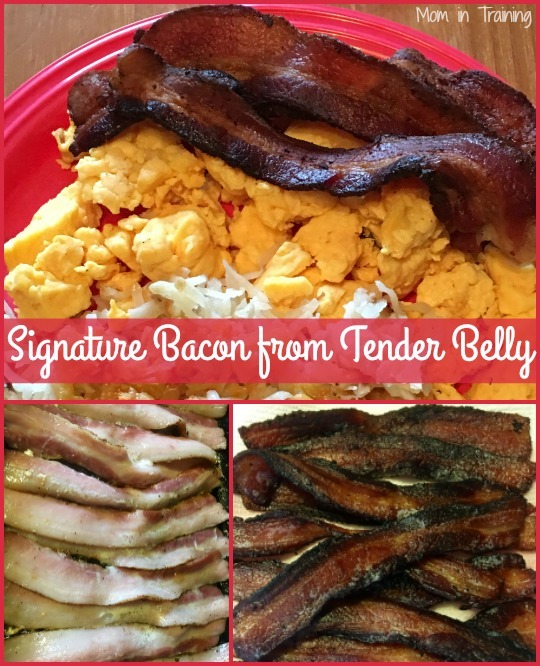 Tender Belly is a brand of bacon that I recently had the pleasure of checking out. You can probably imagine my excitement when it arrived. I was almost drooling over the thick slices of bacon I could see through the packaging. I know what good quality bacon looks like and from what I could see I was in for a special treat. We actually got to try both their maple and habanero flavored bacon. And I have to say we were pretty darn impressed. This stuff cooks up so nice, not like the skinny bacon from that stores that almost disappears when it's done cooking. Even cooked you had nice meaty pieces of bacon strips. I cooked them up good and crisp too just the way I like it. We actually ended up having breakfast for dinner so we could enjoy the bacon a traditional way with eggs and hashbrowns. I cooked up both packages and was sad to say they both were gone by the end of dinner...no leftover bacon for me to snack on later. Did you know there's even a bacon every month club?!? I had no idea until I was browsing around the Tender Belly website. I think I know what's going on my Christmas wish list this year! I love me some bacon! And that right there looks amazingly delicious. How tasty! This bacon looks delicious!